Martin Schulz, on Thursday night with the aim of breaking the impasse over the formation of a new government. President Frank-Walter Steinmeier called the party leaders together after talks between Merkel’s conservative bloc and two smaller parties to form a previously untried coalition collapsed. 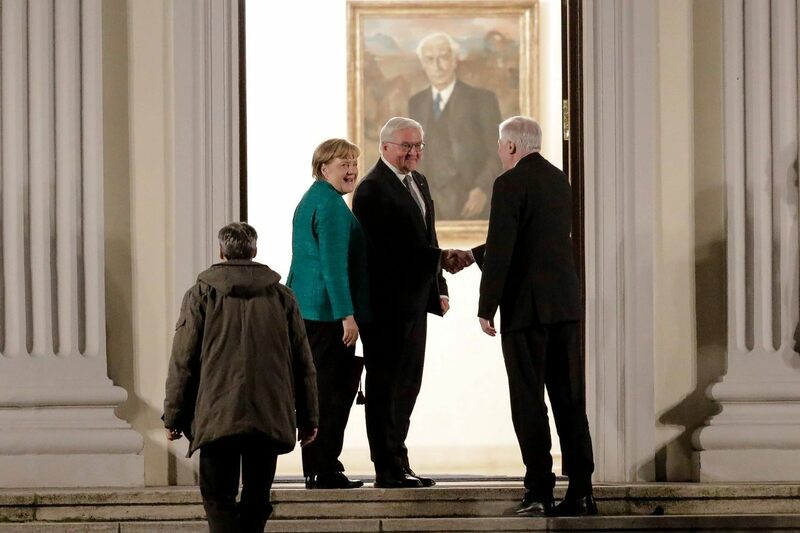 Schulz, Merkel and her Bavarian ally Horst Seehofer agreed to meet at Germany’s presidential palace to explore the possibility of forming a so-called grand coalition like the one that makes up the outgoing government. Schultz had initially refused to consider another “grand coalition” with Merkel after a disastrous showing of the Social Democrats in the election on Sept. 24, saying the Social Democrats needed to go into opposition. But he reversed course after Steinmeier’s appeal, and said his party is now open to holding exploratory talks. He added that his party members would have to have a final say over any agreement. Even if the two sides do agree to continue, they’ll first have to negotiate the prerequisites for coalition talks, then carry out the coalition talks themselves, meaning it will likely be several months before a new government is formed. If Merkel can’t put together a coalition, the only options would be a minority government or a new election. Meantime, she continues to head a caretaker government made up of her conservatives and the Social Democrats.